I can’t imagine how difficult it must be to go through a foreclosure. 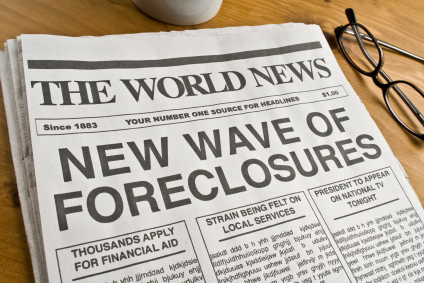 Just imagine the humiliation if everyone you knew found out about your foreclosure? Now you don’t have to imagine it, you can Google it! Google now gives you the ability to search for foreclosures on Google Maps. Not only is Google Maps offering misery mapping options, but Zillow.com, Trulia.com, and Realtor.com are offer foreclosure searches too. The map shows every foreclosure for sale in the Dallas, Texas area. If you move your mouse pointer to one of the red dots, you’ll see the address and the word FORECLOSURE just below it. How’s that for adding insult to injury. Besides the foreclosed homeowners, I’m sure the banks aren’t too happy with this information getting out either since foreclosed houses are vacant houses. Of course I’m sure house-squatting vagrants will love this new search feature. I think mapping misery is just in poor taste. Sadly, what comes next? Will Google, Zillow, Trulia and Realtor.com offer the ability to search for properties based on deaths or divorces? How far is too far? In February, 2011, Google stopped tracking real estate on Google Maps. Luckily your foreclosed house will not show up on Google at least. This entry was posted in Real Estate Horror Stories and tagged Foreclosure, real estate, realtor, search, trulia, zillow by Bill Petrey, Realtor. Bookmark the permalink. I’m sure you’ve already heard about this, but here’s an article that links to a Financial Times.com article talking about Google’s February 10, 2011 removal of all real estate listings! A small victory, but I’ll take it! First of all, thanks for commenting. Since Google’s removal of all real estate listings occurred only days AFTER my article, I can only reply to your “small victory” comment by saying, “You’re Welcome.” I wonder if Trulia and Zillow will cower to avoid my literary wrath too? Or, maybe I just got lucky in my timing. I’ll let you decide. Seriously, Google has been under fire from sites because they’ve started encroaching into those sites’ offerings, like getting hotel rate info off Google without going into a travel site to get it. I wonder if Zillow, Realtor and Trulia might have had some influence on Google’s abandonment, even though Google blames it on poor usage results. As a realtor dedicated to professionalism I am so glad you have started this. We are professionals, and nothing is worse than a lack of ethical behavior, or for that matter, sensitivity to clients going through terrible times. Thanks for the praise. It’s always been of my opinion that if you can’t change or get rid of the bad real estate agents in our industry, you can at least educate and warn people so they can avoid them. Any way we can make it harder for the unethical and lazy to earn a living works for me. You might also want to look at our sister blog “The AgentHarvest Blog.” That blog has a more informational and educational approach to the same goal. Glad you enjoy RRR and thanks again for commenting. Wow, I can’t believe this is available to the public. I’ve known quite a few people who have gone through this and if it was me, I would be furious. Holy cow! That is a total shame! I cannot believe the amount of information they make available to the market. I could be a vagrant and thanks to the Internet I could just search for easy pickings. Even better, you could take a virtual tour of the place and case it to see if there’s anything of value to loot. These sites are becoming a home squatters shopping site.